Europe and China will share data from ocean-monitoring satellites. Twin U.S. satellites rocket into orbit to explore radiation belts and protect planet from solar outbursts. Defense Weather Systems Directorate celebrates 50 years of the Defense Meteorological Satellite Program (DMSP). Russia’s NPO Molnya Space Design Bureau developing hypersonic unmanned rocket vehicle capable of orbiting satellites. Vizada is awarded five-year IDIQ contract with funding ceiling of $2.8 billion to provide land, sea, and air SATCOM services to all federal agencies. Thaicom plans for interim satellite to be placed at its 50.5 degree East orbital slot to maintain the location rights. Dish Network urges FCC not to shift its spectrum holdings in the 2GHz band, and to approve rules for using satellite spectrum in terrestrial settings. Globecomm will introduce new business unit, Globecomm Europe, at IBC. NASA’s Dawn spacecraft to leave giant asteroid Vesta and travel three billion miles in 2 1/2 yeas to dwarf planet Ceres. Russia to launch two space laboratories within next four years. Satellite Interference Reduction Group (IRG), Global VSAT Forum (GVF), and Newtec announce number of meetings and initiatives relating to satellite interference at IBC. Largest public media enterprise in the U.S., Public Broadcasting Service (PBS), installs large set of Newtec M6100 modulators for content distribution as part of upgrade to DVB-S2 and H264, as well as Carrier ID for interference migigation. ITC deepens local presence in Africa with acquisition of Spidersat. SES signs capacity agreement with Romantis, who will use NSS-12 Ku-band capacity to support growing connectivity needs across Russia and Central Asia. KVH introduces new onboard terminal for its mini-VSAT Broadband service including its breakthrough IP-enabled antenna control unit, CommBox ACU, with IP network and Wi-Fi features. United Arab Emirates is elected as member of the International Telecommunications Satellite Organization Advisory Committee. MTN Satellite Communications launches MTN Worldwide TV for maritime customers. Intelsat Mobility offering highlights convergence of FSS and MSS markets. Dish Networks broadens international Internet-based television service to be viewable on PCs and Mac computers. C-COM Satellite Systems receives type approval from ViaSat for its iNetVu Ka-75V antenna system, for operation on ViaSat’s Exede professional Ka-band high-capacity satellite service. Satlink upgrades MCPC platform on AsiaSat 5 satellite to DVB-S2. Advantech Wireless rolls out new X-, C-band manpack BUCs. EchoStar files patent application for rooftop weather station. Satellite companies look to drones for growth. iDirect Government Technologies to provide satellite router board modems to L-3 GCS for Hawkeye III 2.0M VSAT terminals. Eight satellite providers win Custom Satellite Communications Solutions contract awarded by the General Services Administration and the Defense Information Systems Agency for commercial satellite services. He’s sure to be mentioned in every history book everywhere. 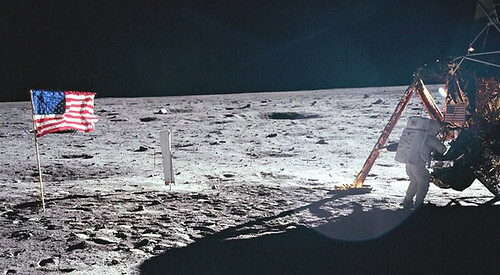 Neil Armstrong: first man to set foot on the Moon. He was a brave guy was flying before he was driving, according to the obituary in the N.Y. Times. Eagle Scout and a test pilot of the X-15. It took balls to be the first, and to live with that fact for many years. Iran’s Minister of Communications and Information Technology denies department’s involvement in satellite jamming; head of health committee rejects denial and claims jamming is dangerous to public health. RUAG Space selected by Orbital Sciences to provide two space-hardened GPS receivers for NASA’s ICESat-2 Earth observation mission. Gottlieb International Group announces first webinar, entitled “The Battle for the Broadband Maritime Customer – Global Xpress vs. EpicNG, the KVH V11, O3b” September 13. NASA twin space probes set to explore Earth’s Van Allen Belts, radiation belts that can jeopardize satellites and disrupt communications when deflected by solar flares. Euroconsult’s latest research report, “Satellite Communications & Broadcasting Markets Survey, Forecasts to 2021″ reveals a good year for FSS operators in 2011. AsiaSat increases profits after abandoning unsuccessful joint venture with Dish Network. Cruise ship lines seek to offer land-quality communications at sea; MTN and Wireless Maritime Services partner to create new smart phone app designed to make at-sea communications less painful. Inmarsat expects demand for mobile satellite communications in Malaysia to continue to grow, especially in the shipping industry. South Africa to launch nanosatellite weighing 1.2 kilograms and running on same amount of power as 5W light bulb in November to collect information about space weather. XCOR Aerospace to establish East Coast U.S. operational base in Florida, and if market develops, build a manufacturing and assembly center for XCOR Lynx Mark II suborbital reusable launch vehicles. Indian Space Research Organization plans 100th launch, carrying two foreign satellites into orbit in September. RIA Novosti planning a space satellite manufacturing plant in Shchyolkovo, just outside the Russian capital. Atlas V launch of National Reconnaissance Office NROL-36 payload rescheduled for September 13. Japan’s Marubeni Aerospace to help Myanmar launch small Earth observation satellite. Inmarsat to launch U.S. based global pre-paid satellite voice and data service. Terrorism trial at Gitmo delayed when Internet service at U.S. naval base at Guantanamo Bay, Cuba, serviced by satellite downlinks in Maine and Maryland, was interrupted because of fiber-optic lines cut during train derailment. Hughes Communications India receives Prasad Film Laboratories contract to implement broadband satellite network to distribute digital cinema content to 1000 sites. Kongsberg Satellite Services gets contract to provide ground station services for the next generation of NAS weather satellites. IPSTAR partners with iDirect to expand broadband satellite solution portfolio for Asia Pacific. Global Data Broadcast, developed by Celestech Inc., enables delivery of data to users everywhere on Earth via new satellite-based wireless broadcast capability using small low-power mobile terminals, high-power transmissions, and pole-to-pole coverage. Invisibility cloak technology research develops metamaterials which are being used in the design of cheaper and easier-to-use satellite communications equipment. SatLink Communications has partnership with Telesat to deliver TV programming to Latin America on new Ku-band MCPC DVB-S2 platform using Telesat’s Telstar 12 satellite. New Satellite Hot Spot product launched by Maxwell Technology set to empower South African township and rural entrepreneurs – World Bank research shows direct correlation between broadband penetration and gross domestic product (GDP). NASA’s Landsat time lapse photos show catastrophic destruction caused by Mt. St. Helens eruption in 1980, and remarkable recovery in the 30 years since. Mississippi low level during 2012 drought contrasted with high level during 2011 flooding in satellite photos. “Tackling Satellite Interference,” a Microwave Journal special report with detailed discussion of sources of satellite interference and methods to combat it, including Carrier ID and Geolocation services. NASA awards California Institute of Technology 5 year $8.5 billion contract to manage the agency’s Jet Propulsion Laboratory. Intelsat 21 launched successfully from a mobile launch platform in the Pacific Ocean; Intelsat 21 will replace Intelsat 9 at 302° East and is expected to have a useful life of more than 18 years. Satellite Broadcasting and Communications Association announces commitment to promote hiring of 4,000 qualified veterans and military spouses into consumer satellite industry by 2014. Newtec rapidly expands Latin American presence beyond Brazil into Argentina, Mexico, Colombia and Peru, while increasing efficiency with Clean Channel Technology and combating interference with Carrier ID insertion in its new broadcast modulator. Penny-sized rocket thruster may soon power the smallest satellites in space. PacStar wins TacSat Nano contract from 6th Contracting Squadron, MacDill AFB. As Russian Prime Minister Medvedev orders Roscosmos to sort out its problems to reverse the string of 7 failed launches and 10 satellites lost in last year an a half, the head of the Krunichev State Research and Production Space Center, Vladimir Nesterov, resigns. Harris is awarded Space Systems/Loral contract for reflector deployment booms for use on two unnamed high-throughput communications satellites. Space Tracking and Surveillance System demonstration satellites participate in test of next generation Aegis Ballistic Missile Defense weapon system. Ball Aerospace Technologies will incorporate essential data communication enhancements for the Joint Polar Satellite System under development for early launch in 2017. Kratos SAT Corp to supply Monics carrier monitoring system and related products to Space Systems/Loral in support of one of its customers that will provide broadband communications services in remote areas. Sagetech Corporation wins Harris Corporation subcontract for AireonSM, a revolutionary advancement in air traffic management that will be hosted on Iridium’s second-generation satellite constellation, Iridium NEXT. Dish Network expected to offer nationwide satellite broadband on Echostar 17, with early offering download speeds of up to 5 Mbps though rates up to 15 Mbps are possible. MTN Satellite Communications and Wireless Maritime Services launch Connect at Sea voice application. Russian manufacturer ISS Reshetnev makes contact with PT Telkom’s Telcom-3 satellite that was placed in useless orbit following failed launch last week. Arianespace sets launch date for Indian Space Research Organization’s next communication satellite, GSAT-10. Georgia Tech to assist Sierra Nevada Corporation in quest to develop commercial space flight system by providing expertise on how to ensure the smoothest possible re-entry for SNC’s Dream Chaser spacecraft. Automated L-72 hour launch countdown sequence is initiated by the Sea Launch and Energia Logistics teams at the Equator for the launch of Intelsat 21 on August 17. Atlas V mission carrying the National Reconnaissance Office NROL-3 payload including cubesats is rescheduled for September 6. View of London’s Olympic Park is captured by the smallest imager aboard ESA’s smallest mission – the High Resolution Camera aboard the Proba-1 microsatellite. Cobham gets $65 million Boeing contract to supply electronic systems for three satellites of WGS satellite program. New detection technique could predict solar flares more than a day before they occur, providing advance warning to protects satellites, power grids, and astronauts from potentially dangerous radiation. NASA selects three teams to advance the state of the art for small spacecraft in the areas of communications, formation flying, and docking systems. 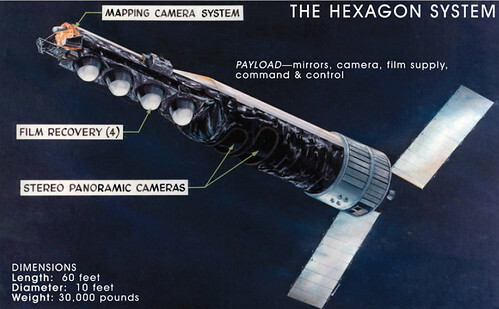 It still amazes me how many resources went into spy satellites in the 60’s and 70’s. Designing, building, launching and operating — all under super-secret conditions — using transistor radio era technology must have been mind-boggling for the non-scientists. And film. They used film to get the images they needed. And how did they get the film back to earth? Why, drop the huge canister in the ocean, of course! 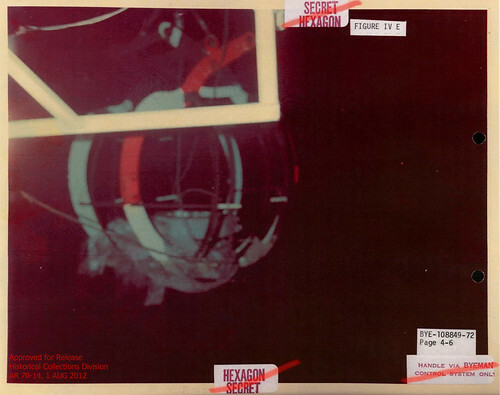 Recent news about the declassification of rescue mission in 1972 to retrieve a canister that dropped into the ocean without a parachute. Imagine that: the rescue mission was classified! Astronomers have found an extraordinary galaxy cluster, one of the largest objects in the universe, that is breaking several important cosmic records. Observations of the Phoenix cluster with NASA’s Chandra X-ray Observatory, the National Science Foundation’s South Pole Telescope, and eight other world-class observatories may force astronomers to rethink how these colossal structures and the galaxies that inhabit them evolve. Lots of fakes out on YouTube. The above video is for real, hopefully, and deserves a look. Explanation: Where will the next Perseid meteor appear? Sky enthusiasts who trekked outside for the Perseid meteor shower that peaked over the past few days typically had this question on their mind. Six meteors from this past weekend are visible in the above stacked image composite, including one bright fireball streaking along the band of the background Milky Way Galaxy. 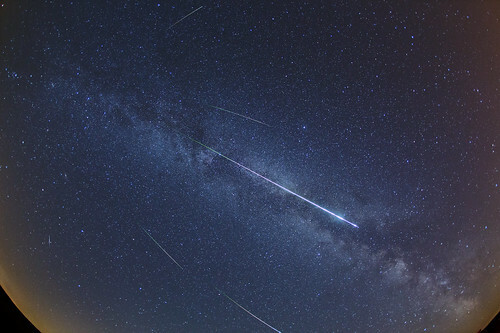 All Perseid meteors appear to come from the shower radiantin the constellation of Perseus. Early reports about this year’s Perseids indicate that as many as 100 meteors per hour were visible from some dark locations during the peak. The above digital mosaic was taken nearWeikersheim, Germany. Roskosmos launches investigation into latest Proton rocket failure, establishing an inter-agency commission for the investigation. UK offers aid to Syrian opposition including satellite phones, medical supplies, and body armor. Cobham wins contract to supply electronic systems to Boeing’s Wideband Global SATCOM satellite programme. Russian Prime Minister Dmitry Medvedev says ” . . . we can not stand this any longer” of the continuing failures of Proton launches causing loss of prestige and money for Russia’s space program. Most recent failure of Proton rocket will delay launch of Dish Network’s EchoStar XVI satellite. NASA signs agreement to use services of the Space Data Association, established by commercial satellite operators to improve safety and efficiency of space operations. Spinning Enhance Visible and Infrared Imager (SEVIRI) instrument aboard the MSG-3 satellite captures its first image of Earth. Northrup Grumman joins the Hosted Payloads Alliance, joining aide variety of companies that support increasing role for defense and commercial contractors in helping government agencies find timely and cost effective ways of acquiring space assets and services. Gilat Satellite Networks announces that Argentina’s Servicio Satelital S.A. has selected Gilat’s SkyEdge II Hub and broadband satellite platform to upgrade its existing network and provide support to hundreds of new sites. Maxwell Technology’s SkyeMax product offering affordable satellite internet access to South Africa’s farming and rural communities. Failure of the launch of Telkom 3 and Russian Express MD2 may indirectly affect launch of Ukraine’s Lybid satellite. Two telecommunication satellites lost in failure of Proton-M rocket booster – Telkom 3 of PT Telekomunikasi Indonesia, and Russian Express MD2. Intelsat sponsors Global VSAT Forum two-day training program for VSAT installers at Pacific Endeavor workshop at Changi Naval Base in Singapore. NASA selects three companies – Boeing, SpaceX, and Sierra Nevada Corp – to develop space taxis to ferry astronauts to the International Space Station. Kratos Defense & Security Solutions announces its SAT Corporation subsidiary has significantly increased its Interference Detection and Geolocation service coverage with two new sites in Maryland and Hawaii, and now covers 1,127 beams from 269 commercial satellites, almost 90 percent of the world’s FSS constellation. Sirius profit soars on $3 billion income-tax benefit. AsiaSat announces signing of Dubai Media Incorporated to broadcast two free-to-air satellite channels throughout the Asia-Pacific region on AsiaSat 5. Gilat Satellite Networks showcases lightweight compact satellite communication solution for unmanned aerial vehicles. Ball Aerospace demonstrates military X0-band MMLCA mobile satellite communications system using phased array antenna. Bulgaria to launch domestic satellite for the first time in more than 20 years. NASA’s most advanced robotic explorer Curiosity steers itself through thin atmosphere and lands successfully on Mars – NASA releases low-res video of descent. Russia and UK discuss number of space projects, and Russian President Vladimir Putin says “We plan to launch several British satellites” while summing up his short visit to London. Siemens CMT releases first Carrier ID Detection System (for combatting satellite interference) by successfully completing the upgrade installation of the latest SIECAMS version. Thuraya IP now offers streaming speed of 512 Kbps, double the previous speed. As we head into another peak sun cycle over the next two years, scientists are again pointing to a heightened risk that a whopping solar storm could knock out power grids, satellites, and communications. Space Systems/Loral happy with launch of Intelsat 20 by Arianespace, as satellite deploys solar arrays on schedule and fires main thruster to complete travel to geostationary orbit. SkyVision Global Networks acquires Afinis Communication SA, a subsidiary of Cable & Wireless Communications and leading provider of connectivity solutions in francophone Africa. DigitalGlobe satellite earth observation photo shows scene of Olympic Village, London, before arrival of the masses. SES announces multi-year capacity deal with Eurovision, increasing capacity to 54 MHz and using SES teleport and NSS-806 satellite to broadcast London 2012 Olympic Games and Paralympic Games to audiences in Latin America. Hylas 2, recently launched by Avanti, to offer high speed data across MEA and caucasus. Israeli legal organization states ‘telecommunications giant admits it violated Iran sanctions’ as it interprets letter from Inmarsat senior vice president explaining the company’s provision of satellite communications to Iranian oil tankers.